But its unusual design is not the only thing that makes it unique. The distinctive bridge stands out due to the dedication of several ITD engineers who oversaw its successful replacement, which began in 1996 and lasted until 1999. At that time, Dave Kuisti was not yet the district engineer but was graduating from ITD’s Engineering in Training Program. 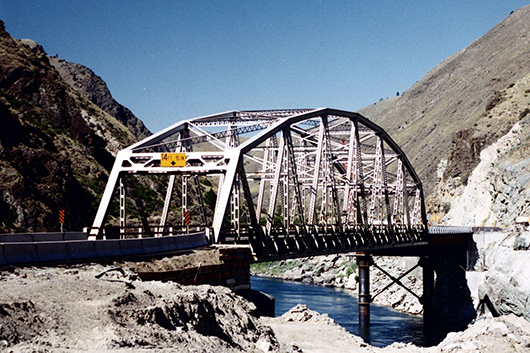 Located on US-95, the Goff Bridge would be a challenge to replace. The structure, built in 1935, spanned the Salmon River and served 2,000 vehicles per day, as well as 12 river outfitters in nearby Riggins. The new structure would have to withstand consistent pressure from a slow landslide at its south end, be tall enough to stay above high water and wide enough to accommodate two trucks crossing at once. To maintain mobility for the traveling public on the state’s primary north-south route during the construction of this three-year project, the design and construction teams planned to temporarily relocate the original structure to serve as the detour. It was the best option given the absence of an alternative route and the close confines of the canyon. Hydraulic jacks and an estimated 72 hours would be required to move the 1.24 million-pound steel bridge to its new location 65 feet to the west. At that time US-95 would be completely closed to traffic through Riggins, prompting ITD to stipulate stricter penalties should contractor Harcon Inc. cause additional delays. To advertise the closure, ITD placed notices all over the state, and even out of the state in Lolo, Montana, which sits on US-12 just across the state line. In the end, US-95 was reopened 36 hours ahead of schedule. Watch a video of the relocation. Robert Gordon, the lead inspector involved with surveying the area for the relocation of the bridge, said he was relieved when it went as smoothly as it did. According to its latest inspection, the Goff Bridge will likely last another thirty to fifty years. *The Goff Bridge was the only tied-arch bridge in the state until the Shoup Bridge over the Salmon River was built last year south of Salmon.